Compared to the Marlene bracelet I made from the same book, “Creating Glamorous Jewelry with Crystals” by Jean Campbell, Olivia is so much easier to put together. But you still get the same high impact stunning piece at the end. I think that is what I liked the most about the projects in this book. In the end you get a statement piece of jewelry that can almost literally speak for itself and pairs well with a simple outfit. 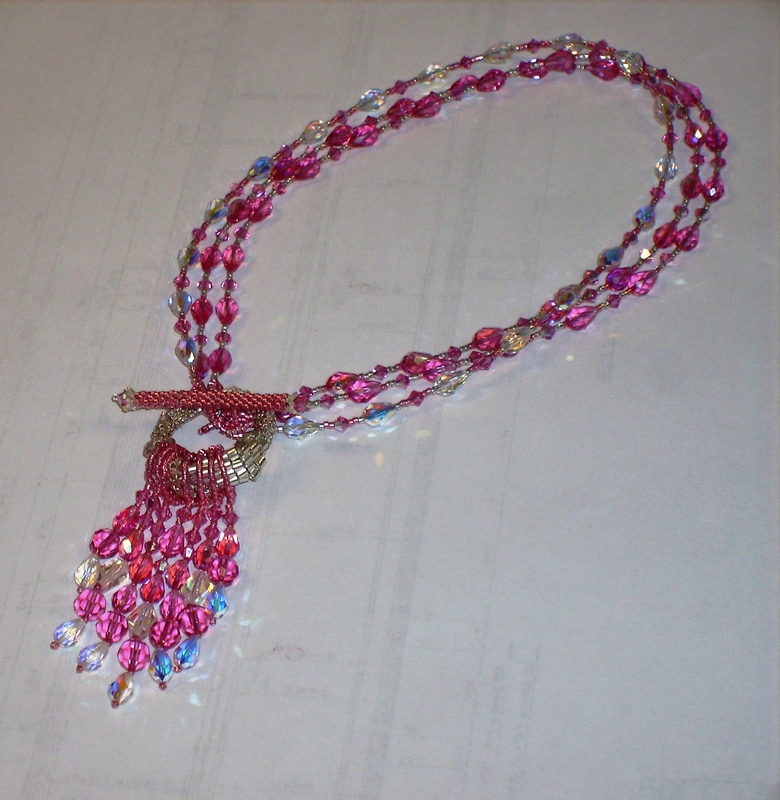 I originally planned this necklace as a complement to the pink plaid Vogue 8789 dress previously posted. But I am hesitant about pairing the two together; since both pieces are very bold. I think I can find a better piece of jewelry to match up with my plaid dress. All total, the Olivia necklace most likely took around 12 hours for me to make. Olivia is probably more intended as an advanced beginner/ immediate beading skill level pattern. One would at least need to feel comfortable with the peyote beading stitch before attempting the toggle ring. Otherwise everything else is pretty easy. The fringe and chain are just simple stringing methods. The toggle bar is a simple zipped up peyote stitch tube. But before zipping up the tube, put in the end loop when it is easier to repeat your thread path on a flat surface. The sculptural peyote stitched ring was only 7 rounds on each side so it didn’t take too long to create. You only need two rings, but I did make this three times. The first time, the double bead stitches were angled out and not laying flush with the rest. So it didn’t look very good. After I loosened up the tension on the first 3 rows, it came together much better looking. I probably should have made the ring a fourth time, but the second and third tries were adequate and didn’t look too terrible. My first toggle bar broke when I sort of pieced everything together (to get an idea of what it looked like) on one strand of the crystals. It broke because I didn’t get enough thread passes through the loop. It was tough to get the needle through the beads on the curved bar. So the second time through, I went ahead and did the loop before zipping up the tube. This worked much better and I was able to get about 5 passes through the loop. It felt very secure and not likely to break. Another change I made to the toggle bar was to make it a total of 32 beads wide instead. The bead width given in the book, was very similar to the width of the toggle ring, so I was concerned that it would be able to slide out and I lose the necklace. A wider bar eliminates that concern. After the clasp break, more troubles came. Lala decided he was going to hop up on the couch and throw the necklace and my bead board off. Every time I would put him on the floor, he would come right back up to terrorize the bead. Eventually, I won out on and he left the beads alone. But that was after he got a hold of the necklace and chewed the flexible wire. The wire needed to be replaced and the bunny got a stern lecture and put in his cage for the rest of the night. Then karma came and got me back. As I was putting Lala’s bedtime blanket over the cage Sunday night, the blanket caught the edge of the bead board and knocked it off of the shelf sending bead scattering all over the carpet. So I was on the floor looking for and picking up beads from the carpet. At least I bought extras of the bi-cones. I think I found all the scattered beads, except for the two beads I found in his cage when I cleaned it out later. I made some changes to the beaded chain of the necklace. Since I was playing with rose crystals, rose aurora borealis crystals, and clear aurora borealis crystals, I made my three strand different. If it was a rose-colored crystal strand, I used the silver as the main seed bead color (pulling back in the silver of the toggle ring). For the clear strand, I used the metallic pink seeds as the main color. I did lengthen the necklace strands. Before and after each briolette, I added a single seed of the opposite color. So for pink crystal strands, it was the pink seed and it was the silver seed on the clear strand. 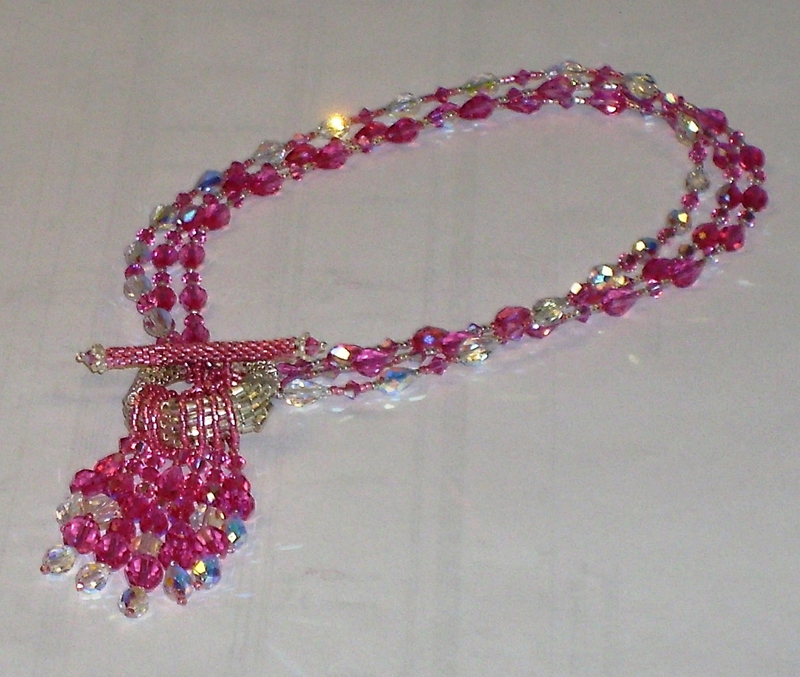 It added just enough length to the necklace that the longest fringe hits at just the right spot above the bust. The original length was a bit too choker length for me. I didn’t see myself wearing something that clings around my neck. This was the first time I have used crimp beads since probably 1997 or 1998. Back then when I learned to use them, I thought they were too hard. There could have been a lot of changes to the beads since then, or maybe I just have better coordination skills now. I didn’t really have any problems crimping the beads. There is a minor gap between the seed beads and the crimp beads. But overall, it doesn’t distract or take away from the necklace’s impact at all. 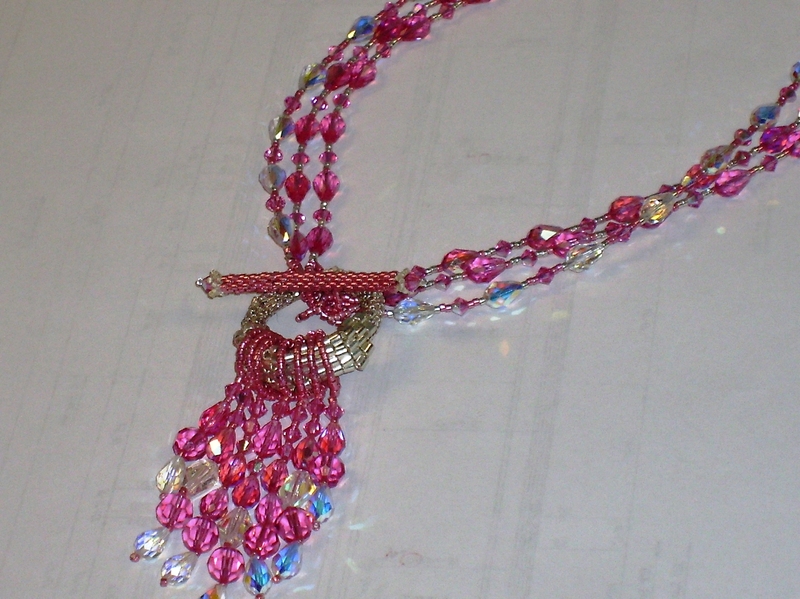 I did crush two seed beads by accident when I did crimp the necklace. They were caught in the backside of the crimping pliers and I didn’t notice it. I doubt I will make another version of this necklace, unless a friend or my sister needs a statement piece of jewelry like the Olivia pattern. I just don’t think it is possible to make another version and it be able to have its own unique piece. Any future version would just make people remember my pink version of this necklace. I just realized that the people I am around the most are guys so chances they wouldn’t notice a minor detail like this are fairly slim. Granted a couple didn’t even notice major details like drastic hair cut changes. So I would probably be ok if I wanted to make another Olivia necklace for myself. But it isn’t really necessary. I really do love the beaded projects in this book. 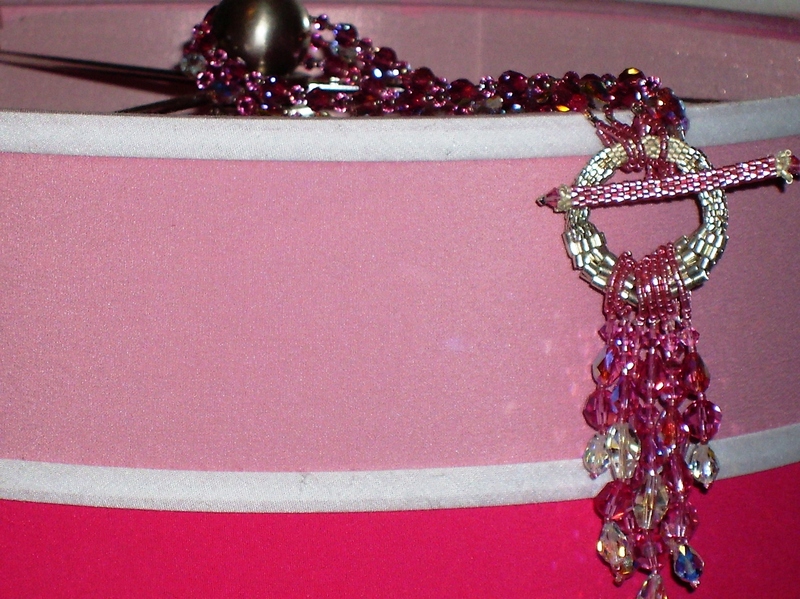 I went ahead and ordered the beads for the Elizabeth Taylor “Apple Blossom” bracelet and “Maggie” a tribute to the bracelet worn by Natalie Woods in “The Great Race”. The night before pulling out the fabric for this project, I had some cotton out practicing with my rotary cutter by making a quilt block. (A side note, that finished quilt block is missing. I should probably send out an APB on it, more likely a CCR (clean the craft room).) Suddenly, my new little pet decided he was going to help out. I think he wants to be a debutant in the sewing community. Sewing community, this is Lala. He came home with me in October. He apparently has a love for helping out with crafts, throwing items (especially remotes) off the couch, getting into mischief, and thinking he is in charge of the power cord for the sewing machine (he doesn’t like the serger though). I think I have finally broke him of the bad habit of trying to chew the power cord but he sits right next to it and me as I am sewing. If I end up with a needle through my finger, it will be because I was too busy watching the bunny and power cord not focusing on the needle like I should. 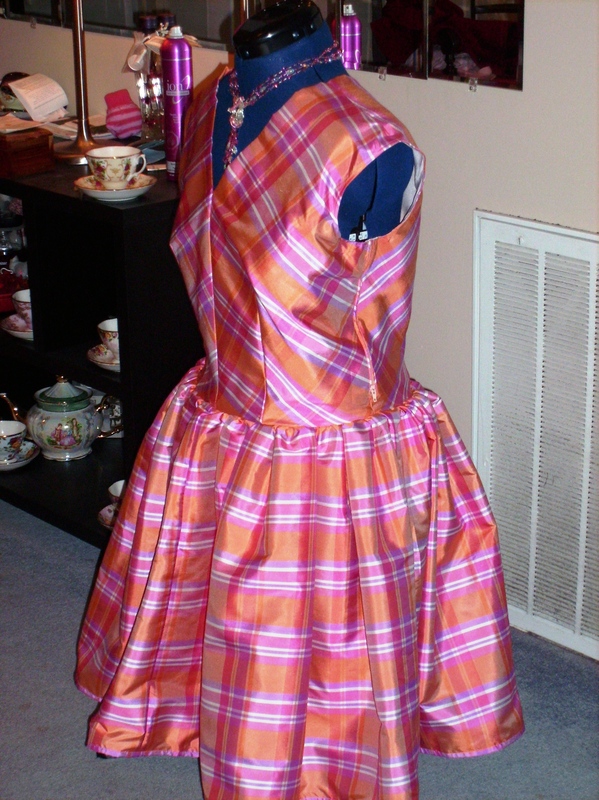 On to the finished project, here is Vogue 8789 in a pink plaid silk taffeta. It is a reprint from 1957. Vogue describes it as a pull over dress with a bias cut fitted bodice in view A which is the view I made. Vogue give you an unlined dress in this pattern. The neckline facings are attached to the bodice pieces so that they are cut out in one piece. Since I was using silk taffeta, I consulted everyone on Pattern Review as to if silk taffeta needed to be lined. They suggested to line it for better use. I picked up some silk lining also from a different online store. Vogue rates this as an easy pattern. I think that is an appropriate rating. I started this on Saturday January 12th. By the end of the weekend, I had about the whole dress done and that was including several 30 minute breaks so the bunny could get out and play. He wasn’t allowed out of his cage while the silk was out. I was just missing back of skirt, skirt lining, horsehair braid, and waist stay. My progress slowed down after that weekend because I had to go back to work and hand sewing. I should have been able to get everything done in a week if I had been better prepared with what I wanted to do. But since I wasn’t sure about doing two skirt panels or four, I didn’t have everything cut at the same time and had to go backwards to cut and serge edges. 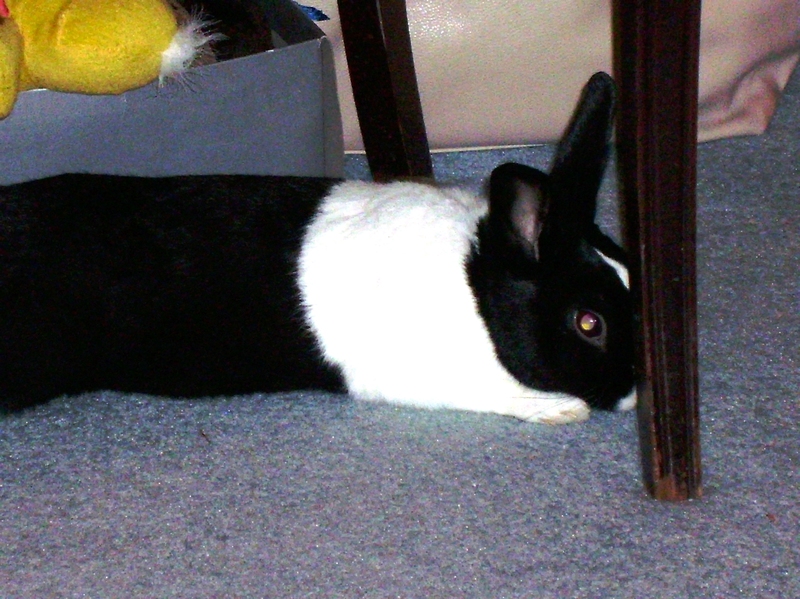 Also, I had a bit of a bunny dilemma. Monday night as I was preparing to cut the last of the silk, Lala had a tantrum in his cage and threw his litter pan across the cage. He wanted out to play. I didn’t want Lala out because I was afraid he would get dirt on my silk. He kept repeatedly throwing the litter pan after I would put it back so I had to keep putting his litter pan back while cutting. After I had everything cut taking 30 minutes instead of 10, I had to let him out so he wouldn’t tear the cage apart. I didn’t get my dress complete until February 4th. I could have possibly finished it over the weekend, but I went out to my parents’ house. I just didn’t feel comfortable enough with the Singer Futura 920 which is set up to operate on a knee peddle. I didn’t want to take chances with my creation just getting ruined because of unfamiliarity with a sewing machine. 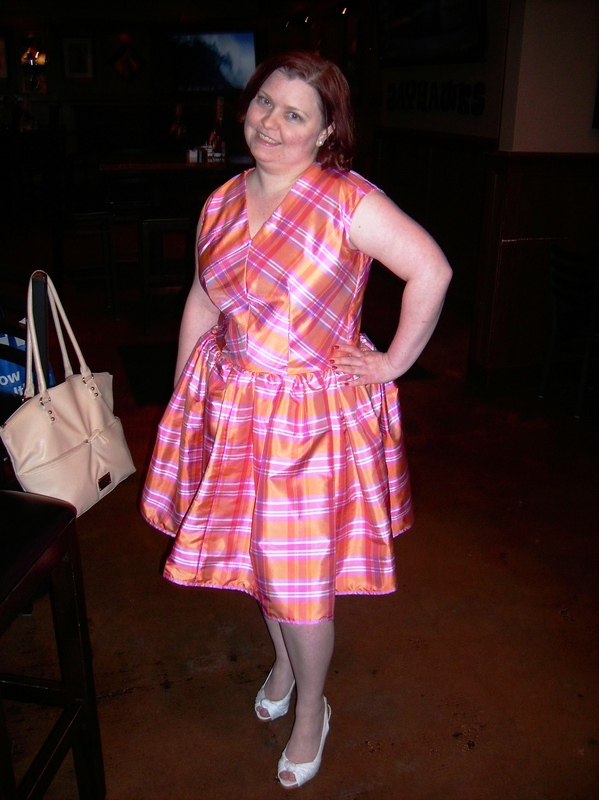 The dress fabric is a silk taffeta I got from an online fabric store. I haven’t really used silk before this dress. I did noticed that my fabric had a great tendency towards fraying. So this did worry me a little. I went ahead and put the serger over all the edges to prevent fraying. It also made it much easier later to do narrow rolled hems with the horsehair braid. • I had troubles with the front gaping- so I took about an inch off the length in the shoulders (so probably about a size 6 in the shoulders). • I added 2 inches length back in under the bust. The finished dress has a wrinkle right at the bottom of the bodice so my 2 inches should have been more of a 1 ½ inch or less instead. • I took about 10 inches off the hem. • Since I was doing a lining, I didn’t bother with the arm facings. • I hand sewed the neckline facings to the lining. • I opted to do a narrow hem with half inch polyester horsehair braid in it instead of the 3 inch hem. I am trying to get all the fluff possible out of the skirt. That is why I went with all 4 panels in the skirt. Most of the versions I have seen online only used 2 panels. 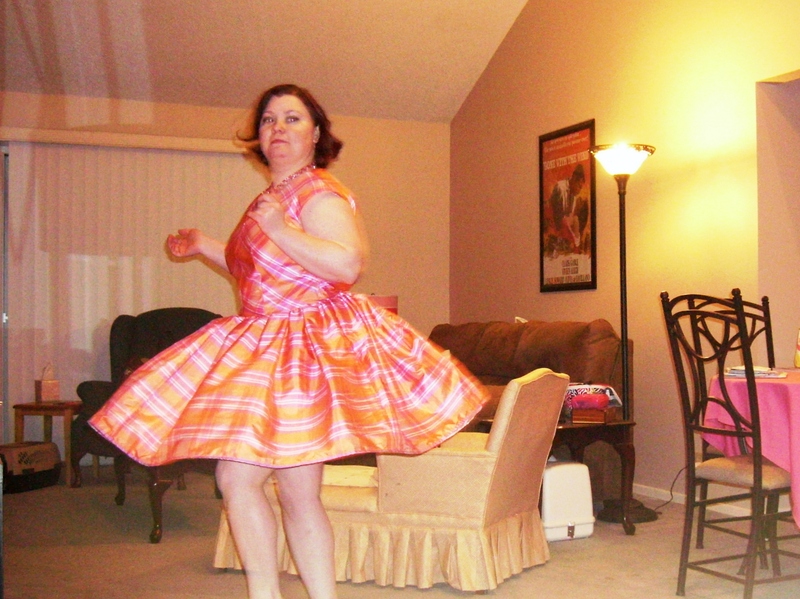 I haven’t decided if it needs a crinoline yet or if I am up to the task of making a crinoline. • I didn’t add a waist stay yet. I need to look into some more tutorials for this to be sure I am inserting it in correctly. I think my original try wasn’t doing what it was designed to do because I placed it too high. So there is one “mistake” on my dress. In trying to conserve fabric and line up everything evenly, I flipped the grain line on the back pieces which changed the color order from purple above pink to pink above the purple. I didn’t notice it until I had the entire bodice assembled. All the lines are matched up pretty evenly that I don’t think this one item will be noticeable by anyone who would see the dress. The only place you can really tell is at the side seams. I did test out this out on my parents and they couldn’t tell until I actually showed them. Otherwise, all the plaid stripes line up very well. But for anyone else making it, all arrows need to point the same direction. The oddest part was the skirt lining pieces would not gather at all. I used china silk for the lining; it is possible that I needed to use a different stitch length than my normal basting length of 7. I had my two lines of basting stitches for the gathers. Every time I would pull the bobbin thread to gather, the fabric would just slip out of the stitches. I got some of it gathered properly. For the parts I couldn’t get to gather well, I had lightly gathered and sort of pleated it into the area I wanted. I absolutely adore this dress. It has the potential of knocking the coral Simplicity 5267 from 1963 (https://sewbeading.wordpress.com/2012/04/09/simplicity-5267-1963-dress/) out of the position of my favorite dress I have made. But that is a tough competition. I can realistically see me making this dress again if the right fabric came along or if I had another special occasion requiring a new dress. It could be a cute cotton summer dress but the weight of the cotton material could be an important factor to consider. 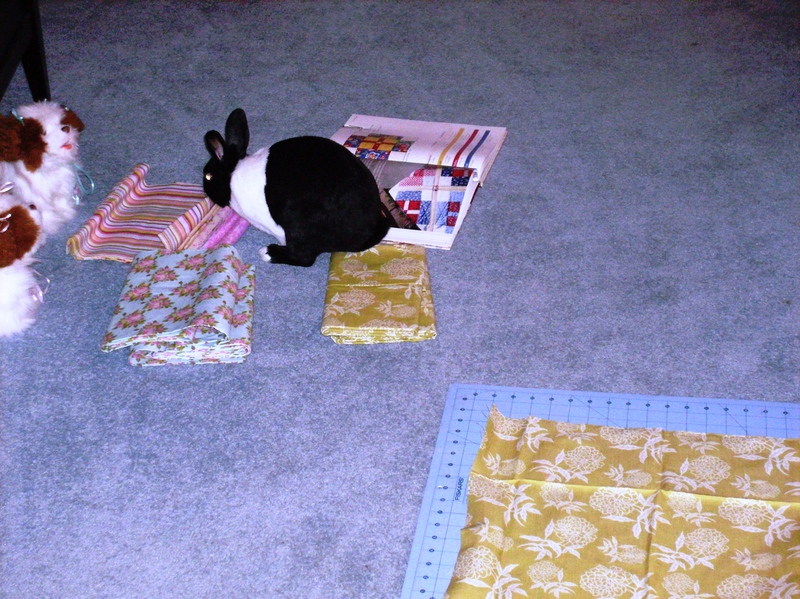 My silk taffeta was fairly thin and very crisp. So a thick cotton would probably not work easily. For a thicker cotton to work, the skirt would definitely need to be re-drafted so that it was lighter. All the skirt gathers would weigh it down too much. I wonder if it would work as well in a knit fabric. Knits are not one of the recommended on the pattern envelope. I would imagine the bodice would work in a knit. The gathered skirt is very questionable. I just don’t have the experience with sewing knits to be positive if it would work. Last summer I had troubles finding appropriate sun dresses to wear to work when I had an allergic reaction to scented laundry soap. This style would be very work appropriate if made in a knit fabric. Vogue 8789 should work well as a base for a fitted costume bodice. I had made a French maid costume from a different pattern before and felt that the top was not the most flattering. This bodice would have looked a lot nicer than the puffy one in my costume pattern envelope which made me look like a burnt marshmallow. A special thanks to my co-workers. Not only did they allowed me to dress up and get my project pictures taken at their Wednesday night social but they also used my ultra fussy camera. Trust me, that camera is a pain. I have threatened to replace it multiple times. There was a reason it was in clearance when I bought it. It doesn’t like not using a flash, doesn’t take pictures immediately after taking one (the wait sometimes means I miss what I wanted) and so much more pickiness. Don’t worry about the dress. I changed immediately after the pictures. I didn’t want to chance spilling anything on my pretty silk dress. It is a nice change from me having to figure out where in my house to do pictures; hopefully you enjoyed the pictures too. Granted I took pictures of it at home too by myself. Next up was suppose to be Vogue 2960, but I left my tracing paper out at my parents’ house which means I can’t work on fitting changes this weekend. So I will probably work on the Cynthia Rowley top in rayon challis instead over the weekend.